1.2 Who cares whether it's counter or not, if it works and it's good? The proviso is that he may have traded on his colourful experiences and friendships with counterculture figures when promoting his ideas and marketing his business. Paradoxically this kind of 'wacky creative' profile plays very well in some corners of 'straight corporate' culture, especially if you're selling scenario planning (it helps the straights feel better about themselves; they feel more rounded and less straight for hanging out with the creatives). Turner is also complicit in this presentation of the Brand persona, because it makes his book more interesting if his central character is colourful and creative. So, as a journalist and a businessman, my feeling is that Brand is more interested in being close to the action and being competitive through innovation than any wider political purpose. If we're trying to pin down where he's coming from culturally and politically, I think the best clue is from his non-profit venture, the Long Now Foundation, an incubator for projects that, in Brand's words, seek to "hack civilisation" to encourage more long-term thinking. Have a look at his TED talk on one of these projects, the Clock of Long Now, where Brand describes the exploration of a remote Nevadan mountain and the experiences that his mates like Jeff Bezos had there. When I watch it, I can't help being reminded of the opening section of Keroac's Dharma Bums, a bunch of guys finding themselves in the wilds of nature, bonding and blending with the oneness of the cosmos. Brand is the WASP kid who, via hanging out with Ken Kesey and dropping acid in 1962 (at a cost, according to Turner, page 61, of $500, which would have bought you a luxury car back then) got swept up in a lifelong search for Beatnik satori. This "all encompassing now" as Turner describes it (page 67) was surely a forerunner of the Long Now. There's the WELL, probably not the first, but certainly the best known and documented, early model of how to build community online. The digital values that geek culture holds dear — principles like net neutrality and Jonathan Zittrain's generative machines — are very much in keeping with the autonomous-but-connected individual that the Whole Earth Catalog was aimed at. Ditto the values of open innovation, BarCamp, Social Innovation Camp and so on — while they may not have originated with Brand and his circle, the latter have certainly been practising them for 40 years. Today's MIT Fab Lab, which enables geeks in Jalalabad to build public Wi-Fi networks out of chicken wire, feels like a Whole Earth descendent of the Rad Lab that Turner praises — in that it brings together different crafts and expertise with powerful tech in the hands of a small group. The One Laptop Per Child initiative, while not without its critics, feels like an attempt to hack education in the developing world with an appropriate-tech engineering solution. And I'm sure you can think of more. I'm not sure quite where Brand stands on power and influence, and what I think of what he says about it. Given his championing of long term thinking, he seems to have little sensitivity to the history of power and vested interests — the tendency of those interests to protect their own, whatever the cost — despite having interesting things to say about the application of history. Perhaps because he has himself had no difficulty hacking into the corridors of power, he seems blind to the difficulties that others might have. There's a quote of his that I'm sure I read years ago, but have failed to find again, which went something like, "Our society suffers not from too many elites but from too few. If you don't like the existing elites, create your own" as though that were the route to a healthier, participative democracy. Sure, easy, let's create our own elite. Let's invite Jeff Bezos, Mitch Kapor, Brian Eno, Al Gore and (we-need-a-woman-who-can-we-ask?) Esther Dyson to join it — I'm sure they'll say yes. Mitch Kapor, whose money helped buy the mountain to house the Clock of the Long Now, has a telling quote that might be a rebuff to that notion, "Inside every working anarchy, there's an Old Boy Network". Or, more likely, they're on the same page, for Turner quotes Brand, "Nepotism works so long as the whole system isn't corrupt" (page 189). As I say, I'm not quite sure what's going on here, or what I make of it — around this point in the book, Turner mentions the influence of G.I. Gurdjieff, and whenever Gurdjieff's name is mentioned I find a kind of Kate Bush/Robert Fripp fog descends… [In discussion at the Innovation Reading Circle, Chris Dymond mentioned Edge, a kind of non-profit sibling of the Global Business Network, with overlapping membership, as an explicit attempt to bring together what Gurdjieff called "remarkable" people, to form an influential elite.] Whatever, it's hard to disagree with Joanne's case that this is no counterculture worthy of the name! Is there an overarching narrative in these cyberculture values? I think there is: an eco-cyber (GM & nuclear) Enlightenment narrative. Brand is swimming in the same water as people like Ray Kurzweil with his Singularity Theory. When he contemplates our post-human future, it's not a cyberpunk dystopia that he sees, but rather a world where we are, literally, "as gods". When Brand talks of whole systems, he really sees us — humans — as being able to stand outside our ecosystem and manipulate it like an engineering problem: a bit of nuclear energy here, GM crops in the developing world, and geoengineering in the oceans to keep climate change in check. I don't buy this. To be fair to Fred Turner, he is occasionally sceptical of our "godlike ability to see the world from above" (page 92) and notes Brand's association with Herman Kahn, quoting the latter: "We take God's view. The President's view. Big. Aerial. Global. Galactic. Ethereal. Spatial. Overall. Megalomania is the standard occupational hazard." (page 186). Not to mention hubris and lack of awareness of your own blindspots. Turner notes wryly that Kahn is mainly remembered today as the model for Stanley Kubrick's Dr Strangelove. I think there's a lesson from Turner's account that he seems to have missed, perhaps because he's too close to it, or because we find it difficult to step outside our present moment and its taken-for-granted 'truths'. Turner doesn't say so explicitly, but seems to believe that Brand has somehow stumbled on a kind of universal recipe for innovation: identify some divergent disciplines, step outside them to see the 'whole system' and then facilitate their open convergence through boundary objects and network forums. Sound familiar? Hello, NESTA! Anything goes… is the only way in which those firmly committed to universal standards and wishing to understand history in their terms can describe my account of traditions and research practices… If this account is correct then all a rationalist can say about science (and about any other interesting activity) is: anything goes. There are no universals, including Anything goes. How many of our most radical, insightful thinkers are in danger of being not amplified but dulled by social media? This mass visibility of trends and memes may be working subliminally to nudge our ideas so that they go with the grain of contemporary orthodoxy rather than against it. Maybe we need less connected people who can go against the grain without worrying about peer opprobrium. We had a very enjoyable two hours of discussing From Counterculture to Cyberculture, during which Joanne and I summarised our points informally. As well as Joanne and me, and Nico as chair, Kathryn Corrick, Becky Hogge, Gordon Joly, Chris Dymond, Louisa Adam and Andrew (didn't register on the Facebook event page, so I don't have surname!) took part. I find it enough of a challenge to listen well and speak at the right moment, so note-taking had to take a back seat, and what follows is very partial indeed. Joanne and I ended up agreeing that Turner has misread what the counterculture is/was, but conversely that we don't think Brand would describe himself as part of the (genuine) counterculture. Chris Dymond stressed how influential Brand's libertarian-communitarian circle had been on the development of the Internet. There were two schools of thought about global governance of the net: a narrow view that it's just the 'code' that should be protected; and a broader view that governance should address digital divide and all the social issues around the net. As founding chair of ICANN, Esther Dyson helped the former school win the day. There was a general view from Chris and others that it was a good thing to separate the core technology from all the social issues around it. Chris also described the Whole Earth Catalog as a "classic silo-busting text", a model for the kind of thing that government is trying (and failing) to emulate to this day. Becky Hogge wondered aloud if the only influence of this 'counterculture' community on the architecture of computing was at the regulation layer. No one could think of any other significant ones! Nico was keen to explore and test the hypothesis that some 'countercultural' values were baked into computers and their applications in society. I think generally we were unconvinced that there was a strong link beyond the ways in which any technology or artefact reflects the tacit assumptions of the culture that created it i.e. personal computers have something of 1970s California embedded in their nature. 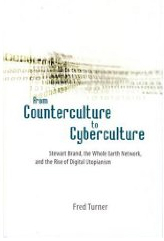 Joanne was angry that Turner made few if any references to cyberculture developments outside West Coast USA, and asked why Project Gutenberg, which was started in 1971, and is a great example of a genuinely countercultural philosophy in action, wasn't mentioned in the book. She referred us to her interview with Michael Hart, founder of the project. Generally many of us felt frustrated with Turner's apparent assumption that what we perceived as longstanding, generic ideas all originated in California in the '60s. For example on page 157, he seems to say that the gift economy — giving without expectation of immediate reward — originated in Haight Ashbury in 1966, whereas we suspected that it had been around for a few millennia by then.